Lucy is an actress and singer (she was in Chitty Chitty Bang Bang in the West End) and she loves maths and science at school. Her favourite food is sushi and edamame beans, and she also loves ballet and pointe work. 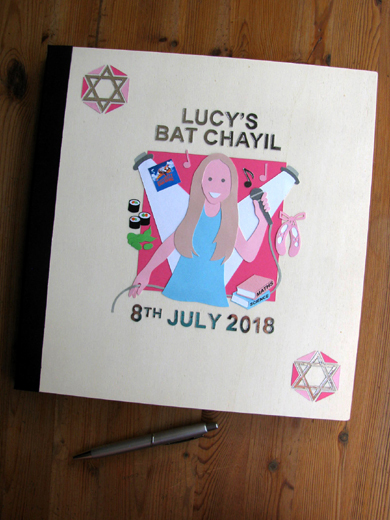 Her mum told me that her daughter's favourite colour is pink and that the colour scheme for her Bat Chayil celebration was going to be hot pink. I have shown blonde-haired Lucy with a microphone in one hand. Behind her are two big spotlights. To her right is the Chitty Chitty Bang Bang logo, the show she was in for a year, and some sushi and edamame beans. On her left are some music notes, some pointe ballet shoes and two books with Science and Maths printed on their spines. Lucy's Bat Chayil appears at the top. The date of her Bat Chayil celebration is below. 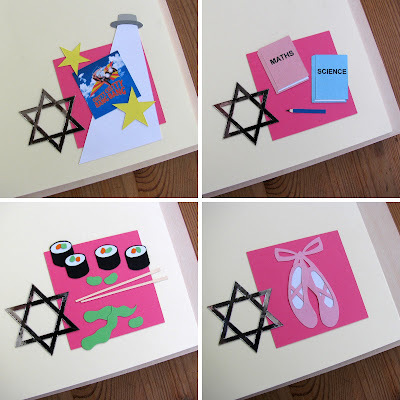 The silver lettering and pink background box match the colours of her celebration perfectly, while two silver Magen David's (Star of David) appear in two corners of the cover, surrounded by shades of pink to match the colour scheme as well. I also decorated five pages inside the album. The first page, the opening page, has a microphone and some music notes on it. Next I added another spotlight and the Chitty Chitty Bang Bang logo, followed by a page with two books on it, illustrating Lucy's favourite subjects at school. I created some teeny tiny sushi and edamame beans for the following page in her book and, finally, for the last page I crafted some more pale pink pointe shoes. Lucy's mum was very enthusiastic about the album. "That front cover looks just fantastic - you really have captured Lucy." she wrote to me, then followed it up to say that "She [Lucy] loved it - so special. Thank you." How special! Love the little sushi rolls! Beautiful! the sushi is perfect! Pink ballet shoes! Who can resist? It's been a while since I've been blogging and visiting, I'm glad to be here again to see your lovely work. Shana Tova!!! So girly and pretty! I love Chitty Chitty Bang Bang. That would be a fun one to see on stage! She sounds like an amazing girl! She is going to love it!! Thanks for sharing with SYC.